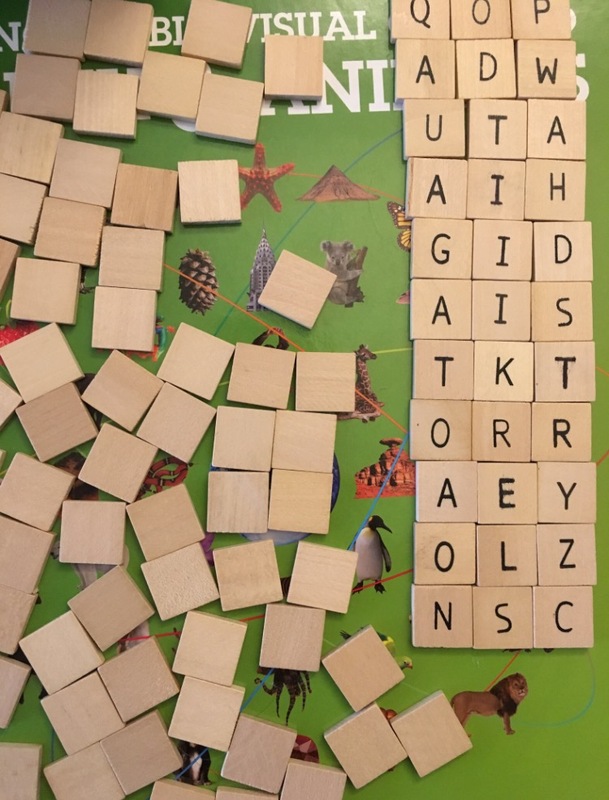 My wife and I developed a twist on the Road Trip game “License Plates” and we play it with a bag of letter tiles (one hundred wooden tiles with letter frequencies similar to Scrabble that we customized to play Anagrams). Reach into bag and pick three letters in succession and set them out in a fixed ordering—order matters. Start a timer for two minutes. You can change this to your liking but we recommend not tweaking it just because one player is struggling, unless you have a younger player who needs a handicap. Two to Ten+ Players (limited only by how many people can sit at a table or see the letters) then sit quietly, with pen and paper, and write down words they think of, hidden from other players, scored according to the Scoring Rules, until the timer ends. You can play as many or as few rounds per game as you like. You can write down as many words as you like, but unlike Boggle, you are not rewarded for the quantity of words, but for quality. A preselected list of words should be agreed on and neither player can say, “That does not count as a word” at any point simply because the other player is familiar with a bogus-sounding word that they don‘t know offhand. The word with the most letters wins. The word that ends with the last letter of the triplet wins. Alphabetical: the word that comes earlier in the dictionary wins. For ties (the same word) neither player gets a point. The word with the fewest letters wins (four or more).